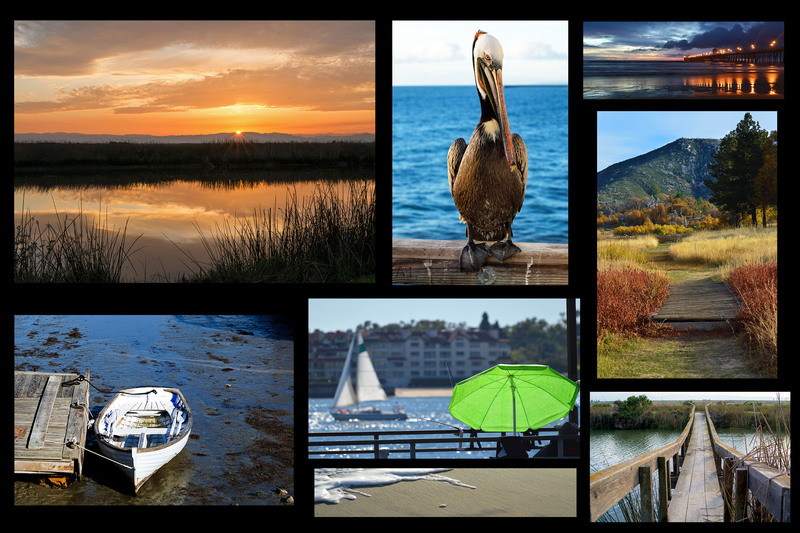 All of our excursions up and down the coast have mostly been on the weekends and during the fall or winter months. This is a time of year when the weather is still warm but the crowds thin out substantially. One day in November we decided to take a day off in the middle of the week to visit what is known as the South Bay in the Los Angeles area. Visiting these usually bustling beach towns on a Wednesday made all the difference in the world!!! It was like a ghost town with no people and plenty of parking. We could move around with ease and, wherever we stopped, we found a parking space right up front. Adding to the magic was the fact that it was a day after a rain so the air was crisp and clean which made colors seem way more vibrant. At the first stop in Manhattan Beach, we of course had to get out of the car to enjoy the sunny yet nippy autumn day. The sun beat warmly on our faces and the cool ocean breeze was reminding us that it was fall and soon shorts and t-shirts wouldn’t be enough… but for now, they were. The Good Year blimp could be seen in the sky probably taking a lucky passenger for a scenic ride along this beautiful California coast. I wondered how it felt to fly in the blimp and how it stayed its course as the wind started picking up. My favorite thing to do is gaze at the houses along the shore. These amazing residences sit right at the edge of the boardwalk with their patios only 12 feet from the sand. I always imagine living at one of these homes and sitting on that patio with a cocktail in hand, food on the grill, and the sunset in the distance. I admit I get a teeny bit envious, but not for long because at least I get to enjoy the beach no matter where I live. 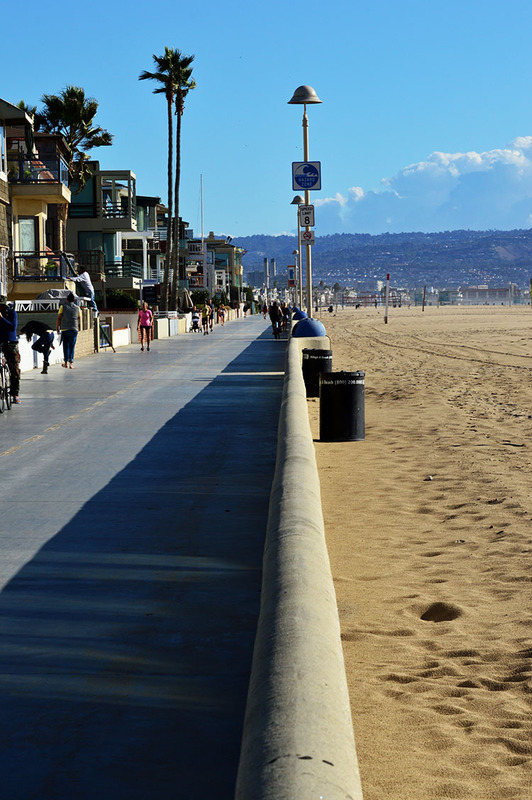 The boardwalk spans for miles making the South Bay a great place to ride your bike, jog, or just stroll and people watch. Moving onward, we tried to stop at Manhattan Pier but they were paving the streets so we couldn’t get through. The area around the pier is filled with really cute shops and unique restaurants and seems like a great place to mosey about on any afternoon followed by a leisurely walk on the pier. Couldn’t get next to the pier because of street paving but got this pic a few blocks away. 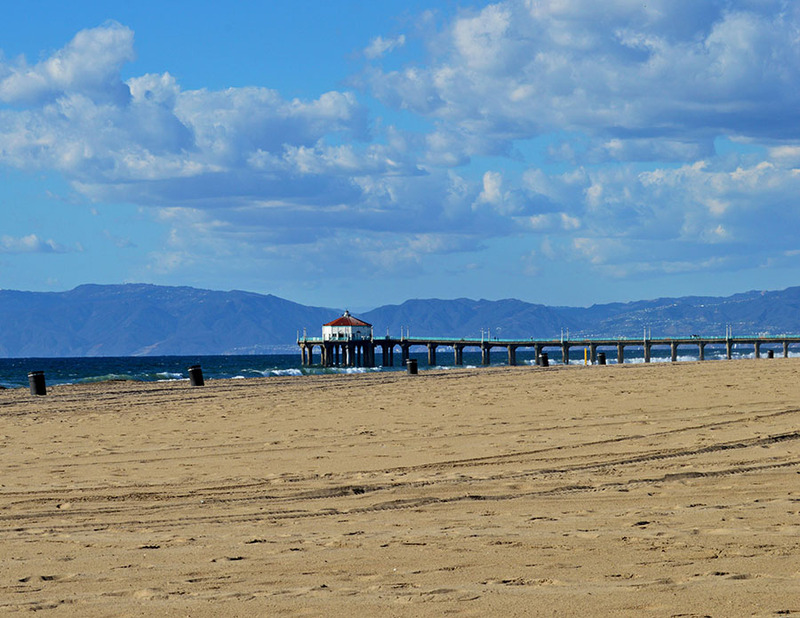 Just a few miles down the road we came across the Hermosa Beach Pier. There are no structures on the pier making it highly unusual compared to the many other piers in California. 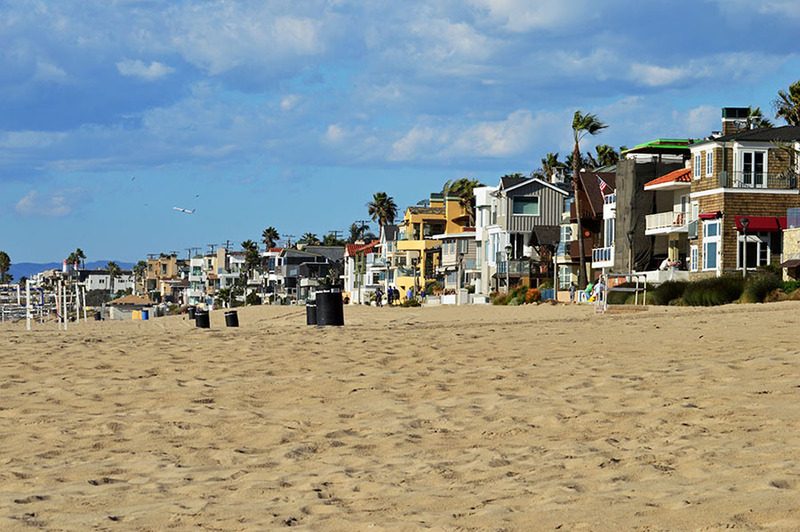 In Hermosa Beach, the homes sit next to the boardwalk followed by rows of houses facing north or south. This being prime real estate, homes set off from the beach are cramped in like sardines. Probably very happy sardines!! 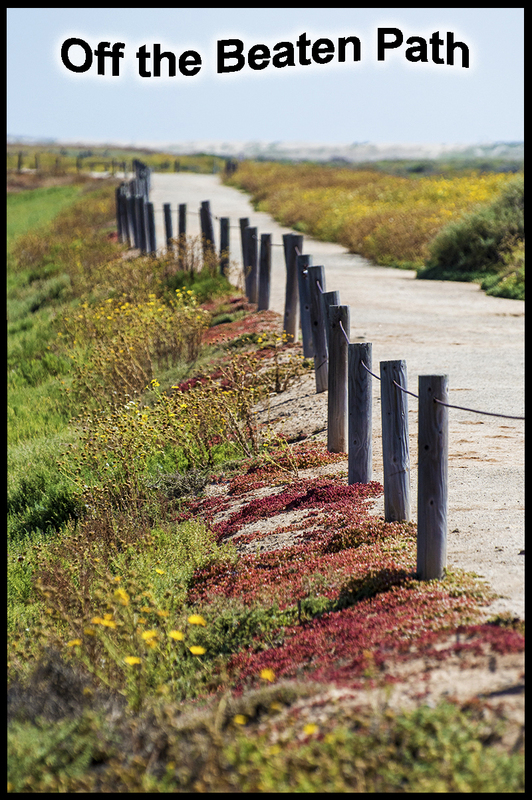 A unique sidewalk runs in front of the houses as a pathway to the beach. Although tight, the patios faced this walkway giving it a cozy neighborhood feel in my opinion. Only steps away on the main road are plenty of restaurants, shops, clubs, and other activities to keep you entertained. 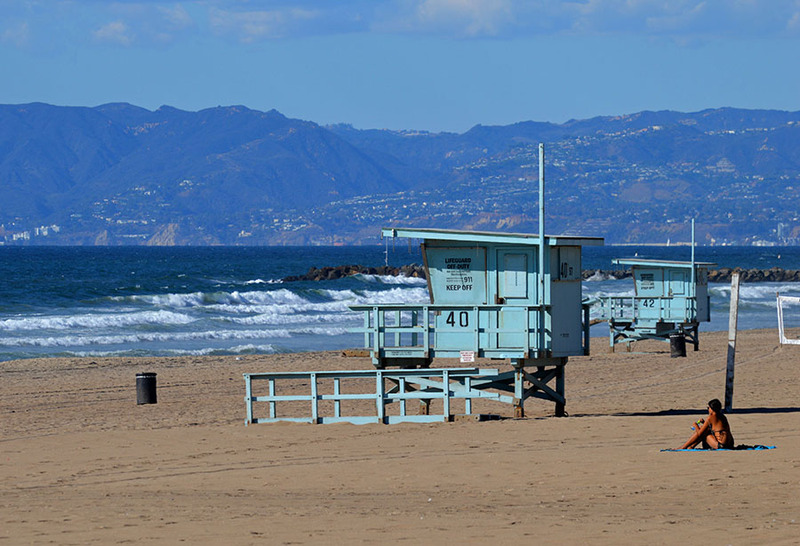 Resuming our drive south, we hit Redondo Beach and King Harbor. We have featured a Staycation on this area in the past so we didn’t explore this area. Unlike the empty pier to the north, this pier is full of life and is a great place to spend the day with its vast array of shops, restaurants, arcades, etc. As the day was slowly ending we started heading back towards Palos Verdes. 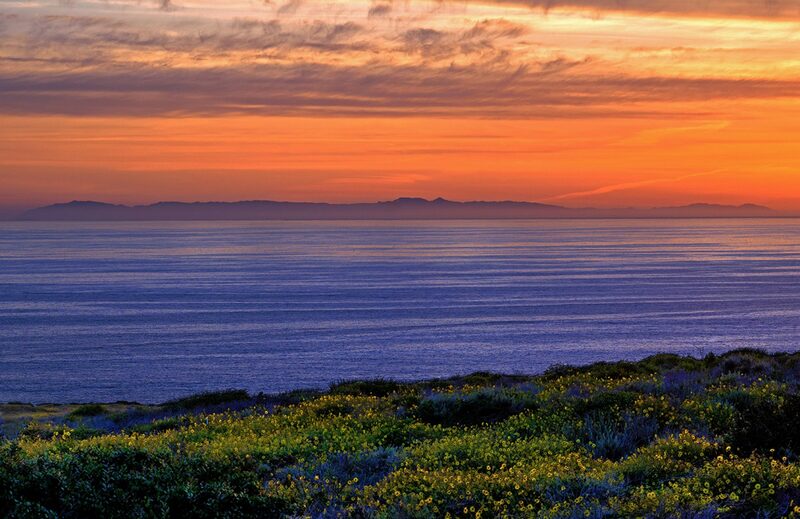 The elegant homes on Palos Verdes are either on a cliff or overlooking a cliff. As we climbed away from the flatland of the beach we starting journeying higher up to new viewpoints that were absolutely spectacular. On one such vista point you could see all the way north past Malibu and east towards downtown Los Angeles. The towering high-rises of downtown L.A. could be seen as clear as a bell. The blimp still floated in the wind and I was wondering how I could get a ride on that thing, or if I even wanted to. 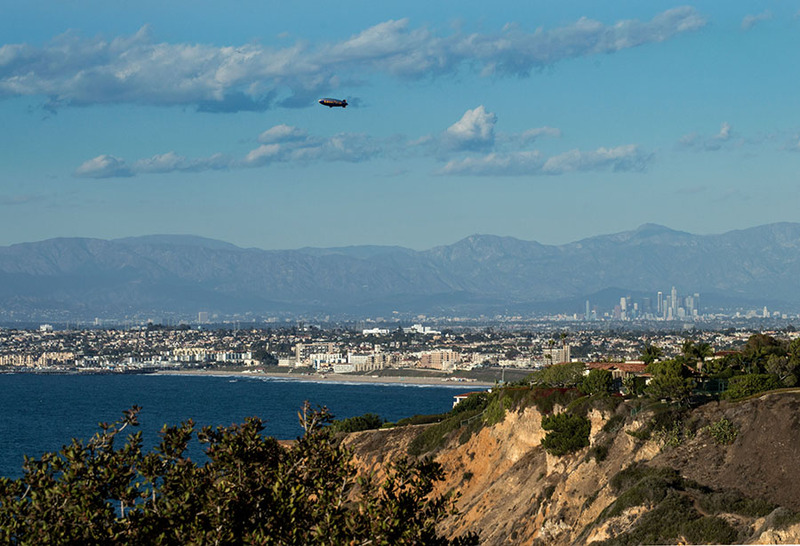 The blimp high in the sky, downtown L.A. to the east and Santa Monica to the north. 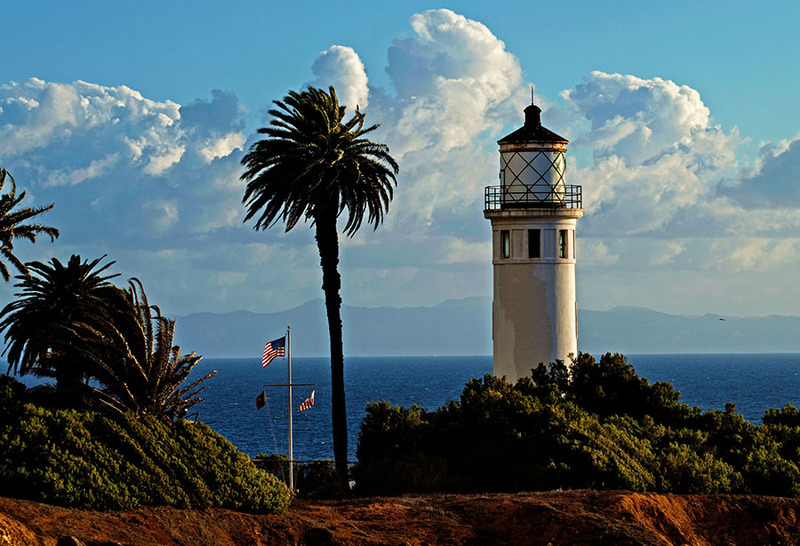 Continuing through Palos Verdes, we pulled into a large parking lot to see the Point Vicente Lighthouse and more views of the coast. The lighthouse was built in 1926 to warn ships of the cliffs jutting out at the point. It is open for tours on the second Saturday of each month, 10am to 3pm PST. Since it wasn’t Saturday, I opted to snap a few pics and then be on my way. We took a short excursion to the Wayfarers Chapel which sits high on the hill and features a panoramic view of the ocean and Catalina Island. Encased all in glass, this Frank Lloyd Wright designed chapel is available for weddings regardless of religion or faith. The chapel is surrounded by shade from the redwood trees and scattered around the grounds are flower gardens, landscaped lawns, and a decorative fountain. Did I mention the views! It doesn’t get much better. On this day Catalina was clear and visible as if you could reach out and touch it. It appeared much larger from this vantage point than what I have seen in other parts of the coast. The Rose Garden is a perfect place for the after ceremony wedding photos and they have evening ceremonies with an enchanting candlelight atmosphere. After we left the chapel we made a quick stop at the Trump National Golf Club which sits grandly on the peninsula and features 18 holes with breathtaking views. The compound features a pro shop and two excellent restaurants. 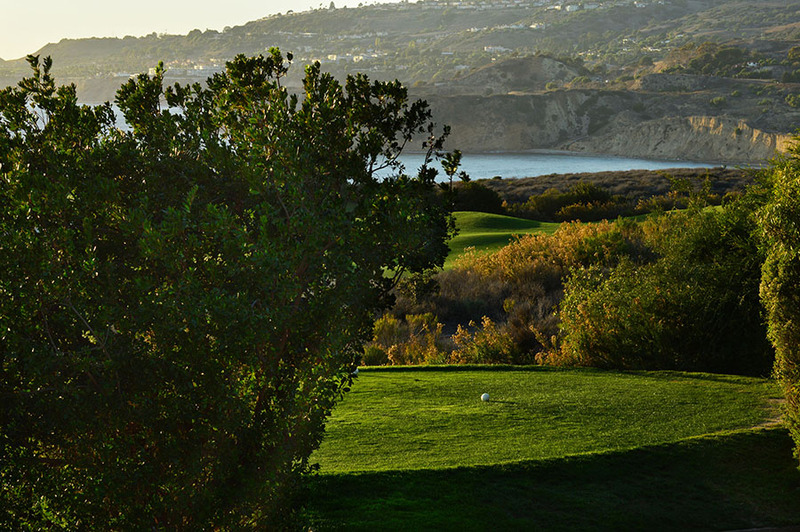 As the sun was setting, it enhanced the green hues of the course which contrasted nicely against the vibrant blue of the ocean. This is a top notch course and one that should be on any golfers list to play in his or her lifetime. Exiting Palos Verdes we knew we were leaving the amazing scenery and tranquility of the cliffs and would soon enter into the hustle and bustle of San Pedro and the Port of Los Angeles. This is where commerce for the whole west coast and beyond begins. There were shipping containers stacked high on ships that were either entering port or getting packed to leave. Besides the ships, there were containers for miles either on the ground, on a truck, or going to some unknown destination on a train. We forgot where we just came from as we now became entranced and fascinated on how you could possibly keep track of all of these containers. As we were leaving this area, I still couldn’t help being in awe of the massive cranes loading the ships and the shipping yards filled with goods. It isn’t all work in the harbor; there is also a place to play. The main channel of the Port of Los Angeles is home to the Ports O’ Call Village featuring an intriguing assortment of shops and restaurants. Nearby you can take a tour on a navy ship and across the street is a quaint marina with every size pleasure boat imaginable. Since the cliffs of Palos Verdes blocked the sunset we were trying to see, we decided to head home. After all we did stop at a lot of places in one short day. Where else can you enjoy the beach, followed by serene hills of unobstructed ocean views, and then head right into the middle of one of the largest shipping hubs in the world? It seemed like I just spent a week’s vacation in 6 hours. It is what Staycations California is all about. Explore your area! Go further and explore an area that always intrigued you. Find a place that you always wanted to check out. Now, I would never encourage you to play hooky from work. However, if you ever feel the need to leave the time card in the tray and get away for the day, just jump in your car and…play!!! There is nothing like a Sunday drive, even if it was a Wednesday.